Many argue that the basketball court was a step too far for the boxing legend. 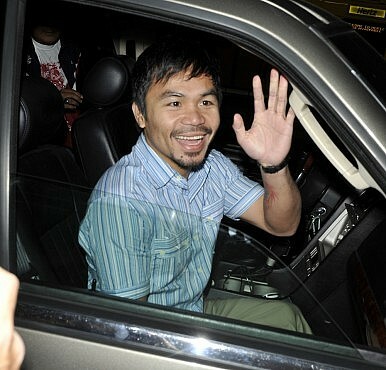 World eight-division boxing champion Manny Pacquiao stunned many when he joined Philippine politics in 2007. But after two terms in Congress, his fans have already accepted that their boxing icon can still manage to fight and win in the ring while occasionally serving in government as legislator. This month, Pacquiao decided to once again reinvent his public image when he agreed to be drafted as playing coach in one of the teams competing in the Philippine Basketball Association (PBA), Asia’s first professional basketball league. There were those who thought it was a mere publicity stunt but Pacquiao actually appeared on his first game as playing coach for the Kia Sorento team last October 19. Wearing jersey No. 17, Pacquiao played a total of six minutes and 46 seconds in the first quarter, he didn’t score a single point, and he committed two turnovers. But his team won the game. At 35 years old, Pacquiao became the oldest rookie to play in the league. Pacquiao claimed that playing basketball is his cross-training activity which helps his footwork and balancing. He is currently preparing for his next boxing fight against the undefeated American boxer Chris Algieri, which is scheduled next month in Macau. Pacquiao’s fans are divided over whether the boxing champ made the right decision to join the basketball league in the middle of his training for the fight. His promoter certainly wanted him to refrain from playing basketball, fearing possible injury. Indeed, Pacquiao should review his priorities. He is still a living hero to millions of Filipinos and fans around the world but he should question the wisdom of carrying too many identities and responsibilities. Pacquiao is not obliged to do everything his advisers and business consultants wanted him to accomplish. Right now, Pacquiao should concentrate on his coming bout with Algieri. And while he deals with his tax evasion case, his constituents also expect him to fulfill his duties as public servant. The May elections will serve as a litmus test for the Duterte administration’s popularity.